Last year, Indiana Conservation Officer Sgt. Ed Bollman was killed in the line of duty. He gave his life while attempting to save the life of another man. This year, his name will be inscribed on a wall in Washington DC during Police Week alongside all the other law enforcement heros from across the nation who gave their lives in the performance of their duties. 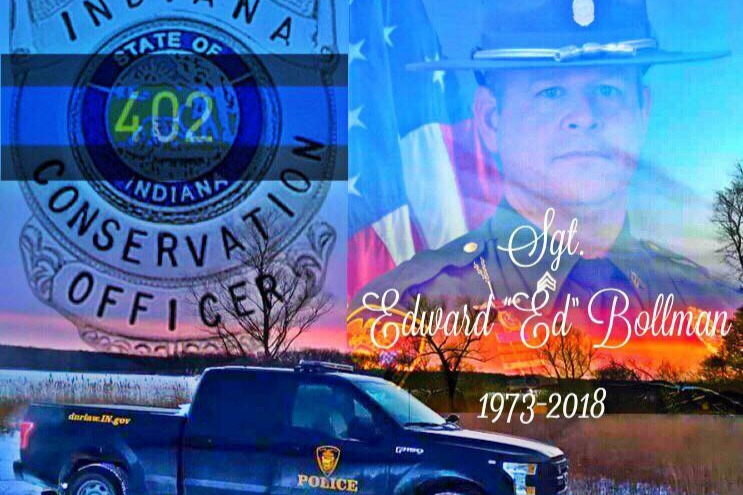 Indiana Conservation Officer FOP #201 is coordinating a fundraising effort to help cover travel expenses so that Ed's wife, child and other family members can travel to Washington DC this May during Police Week. Any monies left over after the travel expenses have been covered will be contributed to the Ed Bollman Memorial Scholarship Fund.